This exhibition is being staged to coincide with Hungary holding the presidency of the European Union in 2011. It follows in detail the careers of five major twentieth century photographers born in Hungary, all of whom emigrated and found fame in the West, but brought with them a distinctively Hungarian sensibility. The five are Brassaï, Robert Capa, André Kertész, László Moholy-Nagy, Martin Munkácsi, and the exhibition follows their careers, decade by decade, through the mid-twentieth century – but the exhibition also features many fascinating and striking works by their predecessors and contemporaries in Hungary in a dazzling display of over 200 striking, original and evocative works by over two dozen photographers. The exhibition is spread over seven rooms, the first two of which describe the culture of pre-Great War Hungary, the capital, Budapest, famous for its cafes, its booming journalism and for innovative pictorial editing. Newspapers and magazines made increasing use of photographs as the printing technology to reproduce original images a) improved b) spread. In the late 1920s hand-held cameras using rolls of celluloid film rather than glass plates became more widely available, and allowed for the development of a new genre and profession, that of photo-journalist, able to capture newsworthy events quickly. These early rooms include works by Angelo and József Pécsi, who incorporated techniques pioneered after the war associated with the art movement of New Objectivity: specifically, experimental lighting, cropping images, unexpected angles. Women photographers were welcomed, including Eva Besnyö. Kata Kálmán pioneered social-documentary photography. There are great photos by Károly Escher and Ferenc Haar. All that said, Hungary was still – like much of Europe – an overwhelmingly agricultural society. 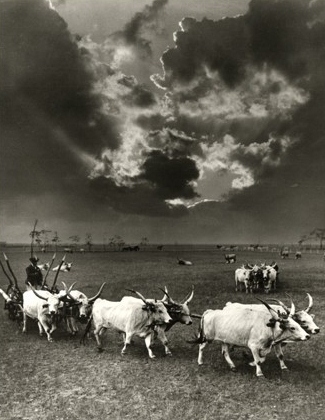 One photographer in particular, Rudolf Balogh explored its rural landscapes and people. He was a leader of the Pictorialist movement, which used soft focus and special printing techniques to raise photography to the level of fine art. The Great War led to the break-up of the Austro-Hungarian Empire. Hungary became an independent country, as its nationalist wing had wished for much of the 19th century – but at the same time lost a huge amount of territory to the other new nations which were carved out in the Versailles settlement, for example the entirely new country of Czechoslovakia, and the now independent country of Poland. In all it lost a staggering 72% of its territory and 64% of its population. Ethnic Hungarians fled from the territory incorporated in the other new nations. No longer was the country part of a huge, expansive and rich empire; now it was small and crowded and poor. Unsurprisingly, this led to a right-wing populist backlash and, throughout the 1920s, the government became increasingly fascist, anti-semitic and anti-intellectual. Those who could afford to, fled. These included all five of our photographers. Moholy-Nagy moved to Germany in 1920 and became a pioneering teacher and designer at the Bauhaus, where he pioneered unconventional perspectives (looking down from the top of buildings, ideally at an angle) and camera-less photograms, where you place objects on photographic film, and turn on a light source, then turn it off – and when you develop the negative it has the shape and outline of whatever object or objects you placed on it. This lends itself to abstract and geometric shapes which fitted well with the Bauhaus aesthetic. André Kertész arrived in Paris in 1925 it was said he was carrying only a camera and a Hungarian flute. He quickly found work at Vu magazine and held his first exhibition in 1927, showcasing his humour and, sometimes Surreal sense of composition. Brassaï (pseudonym of Gyula Halász) arrived in Paris in 1924. He was working as a journalist when André Kertész introduced him to photography which he took to like a duck to water. 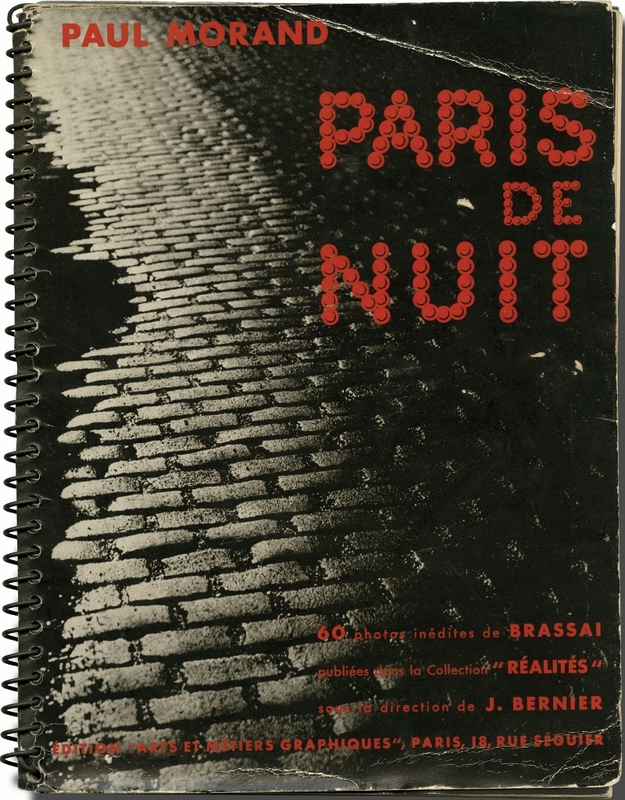 He quickly showed himself to have an acute eye, was taken up by the Parisian intelligentsia, and his name was made by his photographic book, Paris de nuit (1932). Henry Miller called him ‘the eye of Paris’. He spent the rest of his life in the city. Martin Munkácsi arrived in New York in 1934 where he got a job with leading fashion magazine Harpers Bazaar. His experience as a sports photographer and his ability to capture dynamic movement revolutionised fashion photography. Commissioned to illustrate Harper’s ‘Palm Beach’ bathing suit editorial, Munkácsi had model Lucille Brokaw run toward the camera while he photographed. 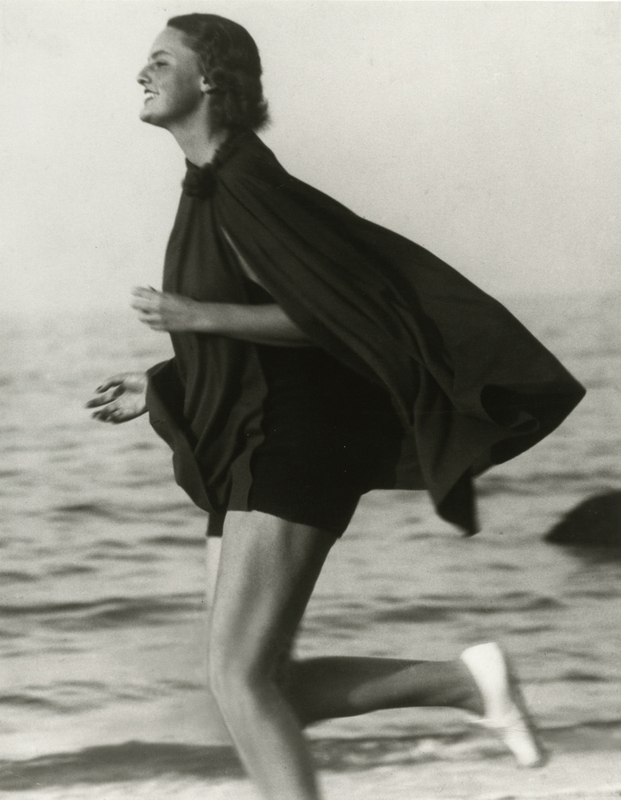 This was the first instance of a fashion model being photographed in motion. He brought a taste for happiness and honesty and a love of women to what was, before him, a joyless, loveless, lying art. Today the world of what is called fashion is peopled with Munkácsi’s babies, his heirs. 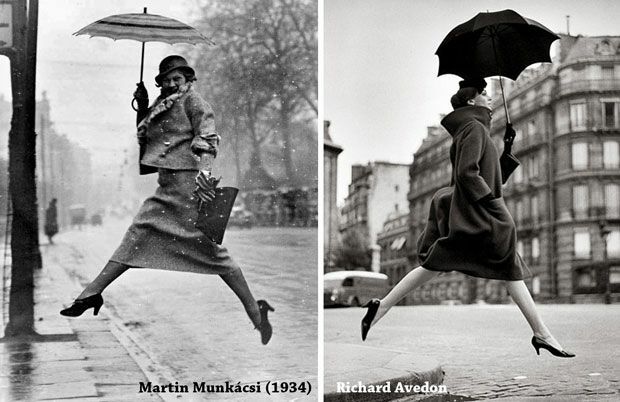 Munkácsi’s influence in introducing ‘spontaneous’ outdoor, action photography into the stuffy world of fashion, and his influence on Avedon in particular, is made crystal clear in this juxtaposition. 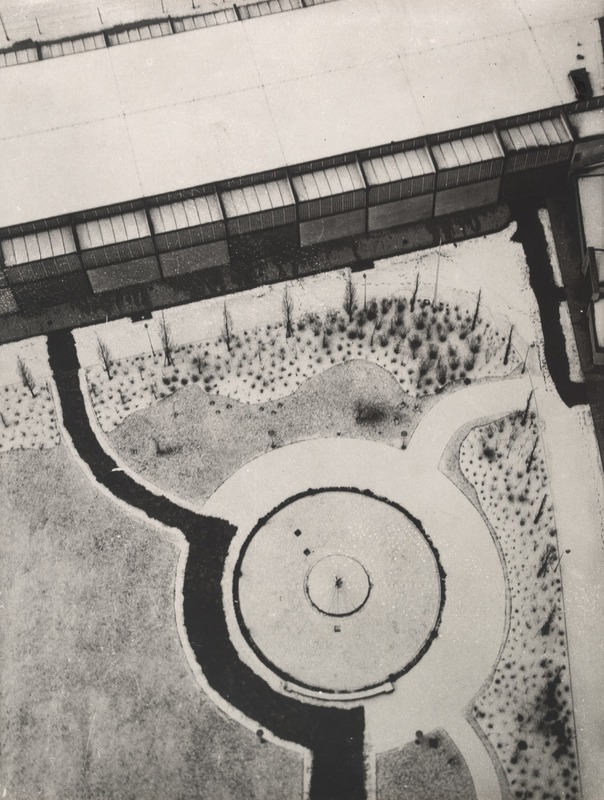 When the Nazis closed down the Bauhaus, Moholy-Nagy fled, first to London, and then on to Chicago where he became Director of the New Bauhaus in 1937, although his job left him little time for photography. Robert Capa (real name Endre Ernö Friedmann) moved to Paris in 1933. At the outbreak of the Spanish Civil War in July 1936, the editor of Vu magazine commissioned the 25-year-old Capa to go and photograph the conflict. His ability to get right to the front and capture moments of actual conflict made his reputation. 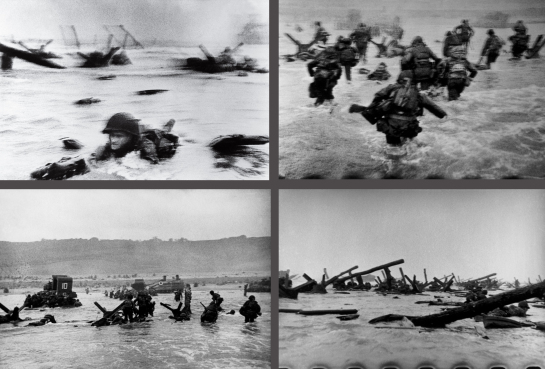 When Picture Post published his Spanish photos, he was dubbed ‘the greatest war photographer in the world’. He would go on to photograph conflict in the Chinese war against Japan, in World War Two, specifically when he landed on Omaha Beach on D-Day, in the post-war Soviet Union, in Israel at its founding in 1948, and then in the IndoChina War where he was killed, stepping on a landmine, when he was only 40. Amazing life. Amazing legacy. In 1947 he was awarded the Freedom Medal, presented by Dwight Eisenhower. In the same year he set up the photography agency Magnum, along with fellow snappers Henri Cartier-Bresson, David Seymour and George Rodger. 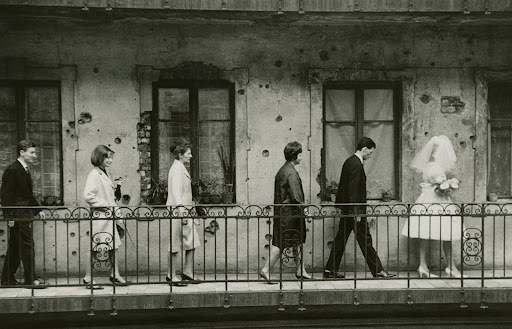 The final room traces Hungary’s sorry history from the 1940s to the 1980s. Under its military dictator, Admiral Horthy, Hungary entered the war on 26 June 1941 by declaring war on the Soviet Union, and six months later on the Allies. Once it became clear the Allies would win, Hungary tried to leave the war in 1943, and was occupied by German forces in March 1944, who installed a fascist Arrow Cross party in government and promptly started rounding up Hungary’s Jews and sending them to the death camps. This was overthrown in 1944 by an interim government which declared war on Germany – now very much retreating before Soviet forces – and signed an armistice with the Allies in January 1945. In February 1946 Hungary was declared a republic, but two years later the Hungarian Workers Party was helped into power by the Soviet occupying forces, and imposed a copy of Stalin’s repressive communist regime. After Stalin died in March 1953, a political thaw of sorts slowly spread through the eastern Bloc which led in October 1956 to a popular insurrection to overthrow the communist government, which the ‘liberal’ leader of the day, Imre Nagy, decided to support. Bad decision. Tanks from Russia and all the other communist bloc states invaded Hungary, crushed the insurrection. Some 26,000 rebels were brought before the Hungarian courts, 22,000 were sentenced and imprisoned, 13,000 interned, and some 300 executed. 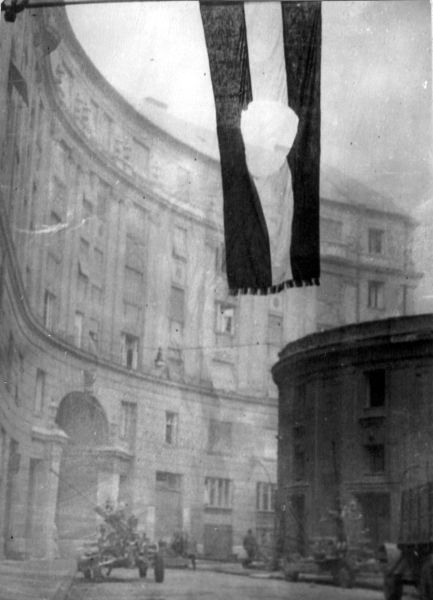 These included Prime Minister Imre Nagy, executed after a secret trial in 1958. Approximately 200,000 fled Hungary as refugees. The new, hard-line pro-Soviet communist government remained in power, supported by Russian tanks, until 1989. The last couple of rooms show photographs of these dramatic events – war, revolution, insurrection, repression – and then document the decline of photography as an independent, experimental activity under harsh communist rule. Socialist Realism, heroic photos of happy peasants toiling in the fields, or workers smiling in steel factories, were what was required. A little more individualism crept in during the 1970s, and then the trickle of information and styles from the West turned into a river with the advent of Mikhail Gorbachev as General Secretary of the Soviet Communist Party, and then a flood which, in 1989, was to tear down the barbed wire fencing the country off from the West, the overthrow of the communist authorities, free democratic elections, and the joining of the European Union. This photo by László Fejes won a World Press Photo prize in 1965 but the authorities disapproved because it showed all too clearly the bullet marks from the 1956 revolution, with the result that Fejes was banned from publishing photographs for years.